NETWORK FINALS: BLINDSPOT lost 0.1 in final numbers, and JANE THE VIRGIN gained the same. CABLE HIGHLIGHTS: On A&E, BATES MOTEL returned at 0.66, up 0.08 from last season’s finale (but down 0.02 from the prior episode, and off 0.26 from last year’s season premiere, itself down 0.34 from the 2014 premiere), while DAMIEN premiered at 0.31. USA’s WWE telecast took the Monday cable lead with 1.29/1.27/1.23, compared to last week’s 1.38/1.31/1.26. On VH1, LOVE & HIP-HOP dropped 0.12 to 1.23, STEVIE J & JOSELINE GO HOLLYWOOD was down a tenth to 0.88, K MICHELLE: MY LIFE fell 0.11 to 0.75, and HIT THE FLOOR lost 0.12 to 0.54. AMC’s BETTER CALL SAUL slipped 0.05 to 0.94. MTV once again labeled TEEN MOM as a “special,” down 0.06 from last week’s special to 0.70, and TRUE LIFE was down 0.02 to 0.34. On Discovery, STREET OUTLAWS was down a tenth to 0.69, and MISFIT GARAGE took over the 10PM slot with 0.43, 0.11 below last week’s ROCKIN ROADSTERS. 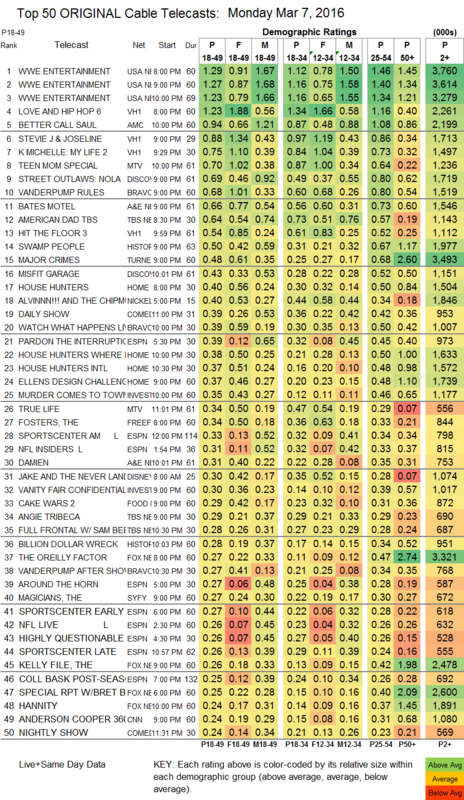 Bravo’s VANDERPUMP RULES was down 0.02 to 0.68, with the AFTERSHOW steady at 0.27. TBS’s AMERICAN DAD gained 0.09 to 0.64, and FULL FRONTAL edged down 0.02 to 0.28. History’s SWAMP PEOPLE was down 0.02 to 0.50, and BILLION DOLLAR WRECK lost a tick to 0.28. TNT’s MAJOR CRIMES climbed 0.09 to 0.48. On Comedy Central, THE DAILY SHOW featured appearances from the stars of BROAD CITY, and had a strong night at 0.39. Freeform’s THE FOSTERS had a healthy 0.08 bump to 0.34, and RECOVERY ROAD rose 0.04 to 0.21. Food Network’s CAKE WARS was 0.02 more delicious to 0.31. 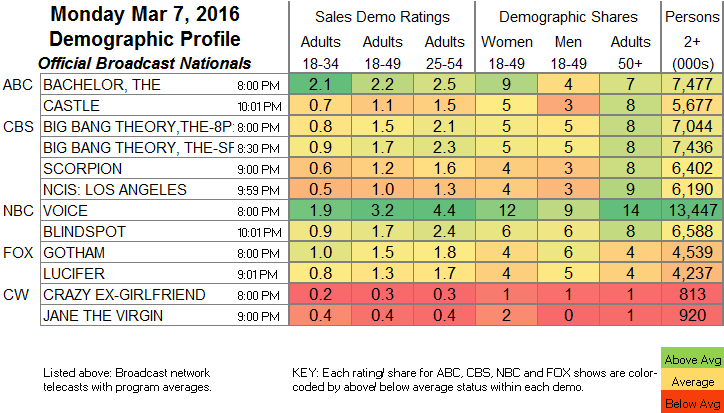 THE MAGICIANS grew by 0.02 to 0.27, LOST GIRL ticked up to 0.12, and BITTEN was up 0.02 to 0.11. Logo’s RUPAUL’S DRAG RACE was at 0.17.